Hi Everyone, this is Debra from Common Ground! Yay! What an honor to be invited by Kim to be a part of her great weekly series, "My Favorite Room". I don't think it was any surprise to Kim that I would want to share my sun porch with all of her readers. This isn't the prettiest room, or the most stylish room, or the best decorated room, but by far, it's the most fun room at my house. I had always wanted a sunporch, and since we moved here, this has been my favorite spot to decorate. It's just a little "add-on" to the existing deck from the 90's. It's doesn't have heat or air, except an open window, but no matter what time of the year, it's visible from my kitchen, and that's why it's my favorite room. I see it a hundred time throughout my day. Weather permitting, it's where I have coffee in the morning and it's "napping central" for the fur girls. I love to change up my decor for the seasons and holidays, so this is the place I can go crazy with color and vintage finds. 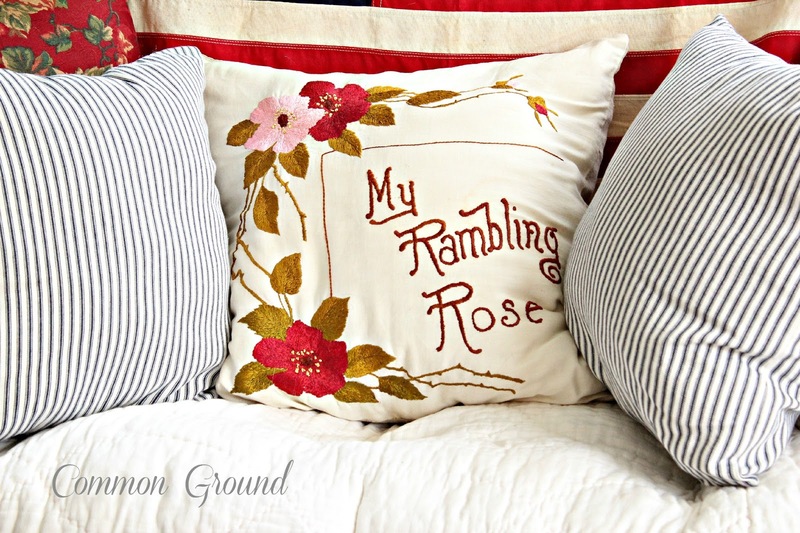 The rest of my house is fairly neutral, and actually so is this space, but by adding vintage quilts, garden goodies, and all sorts of seasonal fun, it turns into the most colorful room of the house. There are French doors from the Living Room and a slider from the Kitchen, and then a door to the deck, so it's always flooded with wonderful northern light. That makes it a great spot for photos no matter what the season. I have a fun collection of vintage quilts and tons of pillows, so they are the basis of the seasonal decor. I try to keep it changed up almost every month. 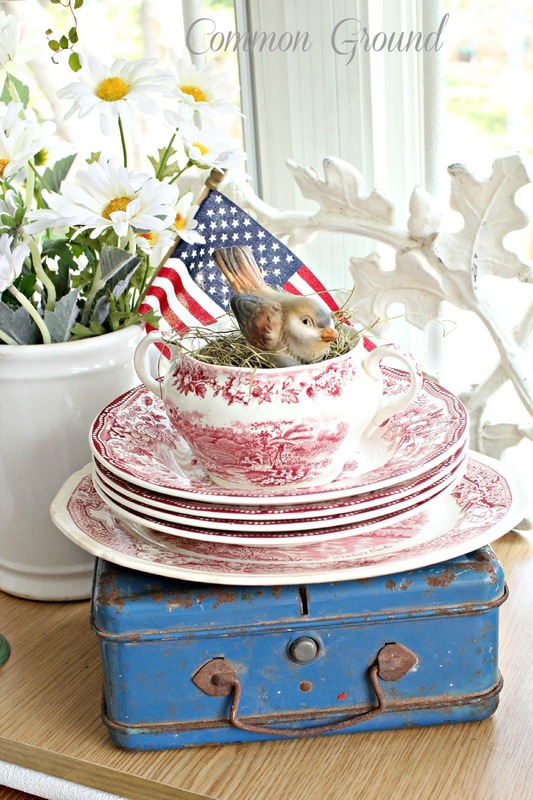 This month for the July 4th Holiday, it's dressed in reds with some patriotic pieces added in. 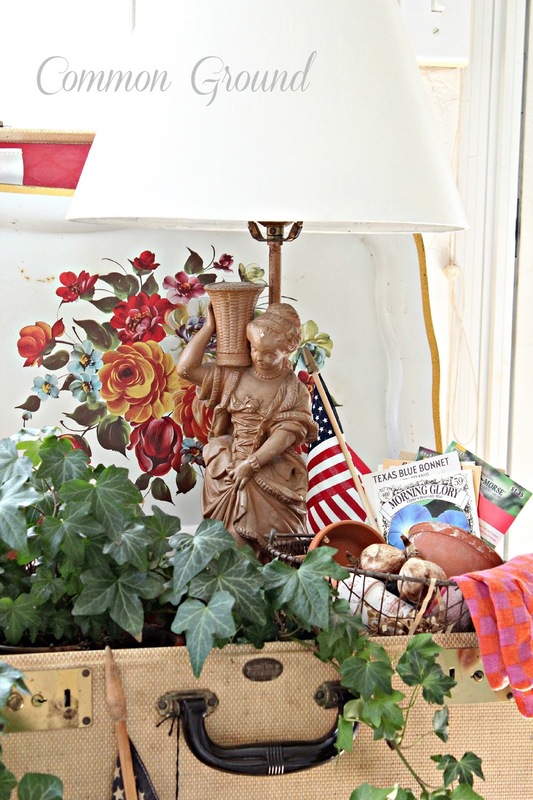 Here, a vintage linen picnic hamper holds my little French girl lamp, an ivy, some garden tools, and an old tole tray. 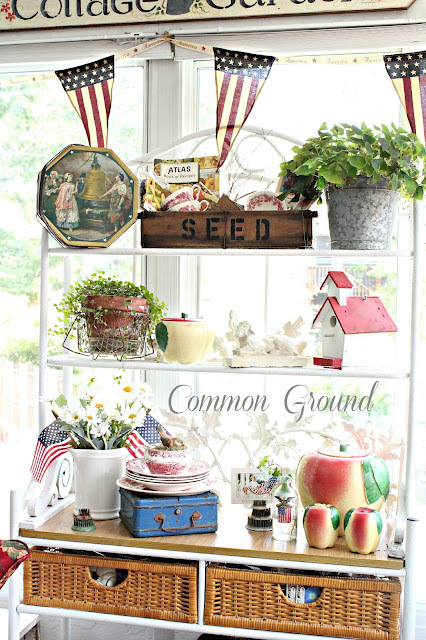 Vintage garden goods are at the top of my list for fun finds, and most of them end up out here. It's crowded and cluttered, and just the way I love it. This is a little conservatory that was made from old windows and house siding that I bought when we first moved in. The top lifts on the Fleur-De-Lys hinges. Inside is a small lamp, prints, and a collection of old wire egg baskets. about 10 years ago, except for the rocker which is an antique. 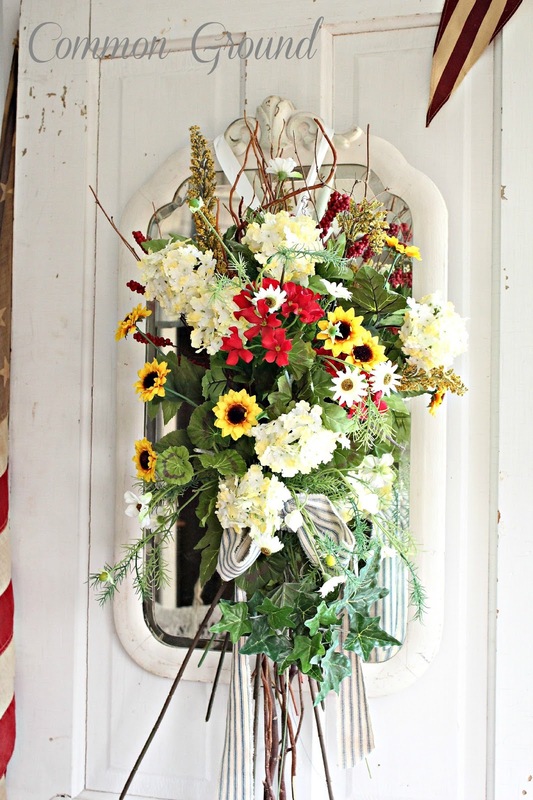 and always a seasonal faux flower arrangement. and I try to keep them mix and match for the seasons. My favorites are always the vintage embroidered ones. so there's always one out here somewhere. 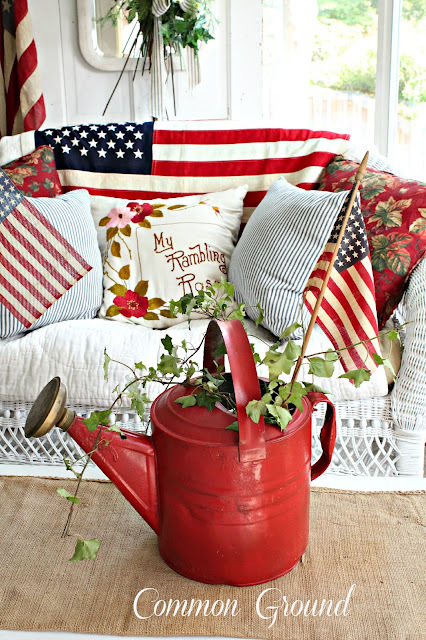 this time my red one with some ivy and an old parade flag. and such a fun spot for my ever changing displays. and wrought iron porch railings. Here's a collage with a few other seasons represented on the porch. but to me it's the perfect little playhouse. 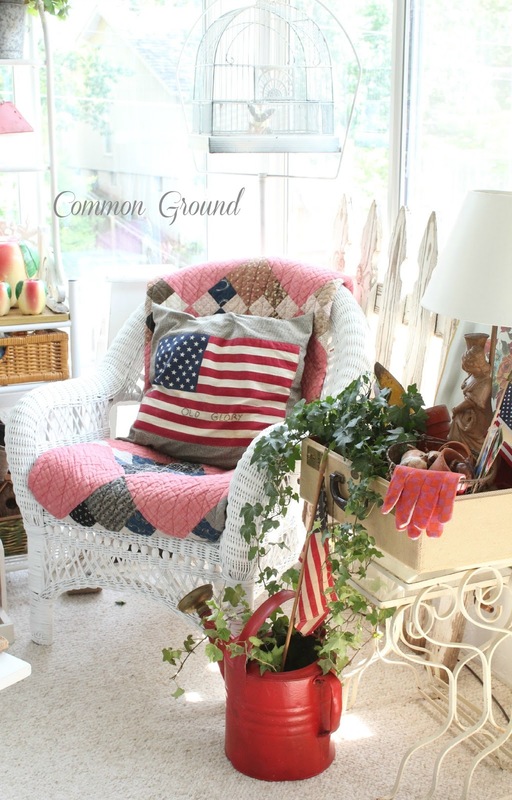 Please come by to visit over at Common Ground. Thanks so much for letting me share my sun porch, Kim. Hope you all are having a great Independence Weekend! Thank you, Debra, for sharing your wonderful patriotic sun porch. 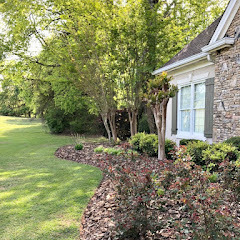 I hope y'all will pop on over to Debra's if you don't know her blog and say hello. If you have missed any of the past favorite room posts you can check those out here. What a cheery room Debra. I can see why it is your favourite . 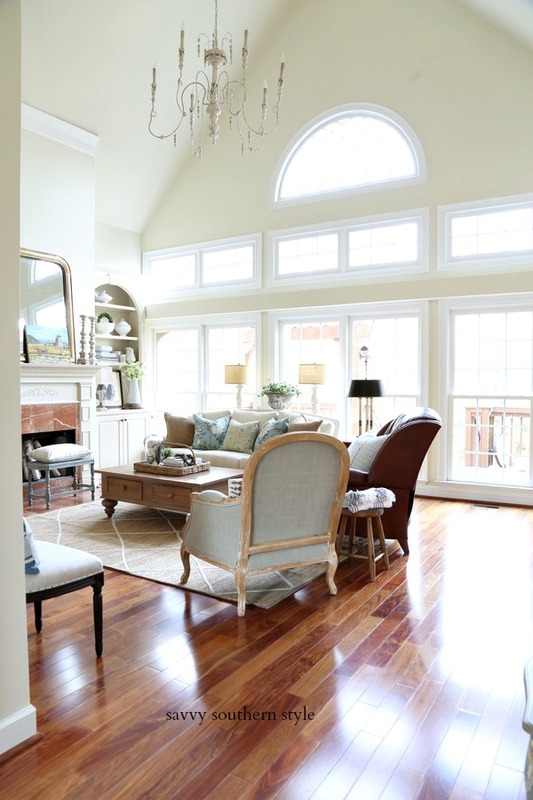 There just is something special about sun rooms and us girls I think. Thanks Kim for sharing, and Debra for allowing us a troll through. So sweet! 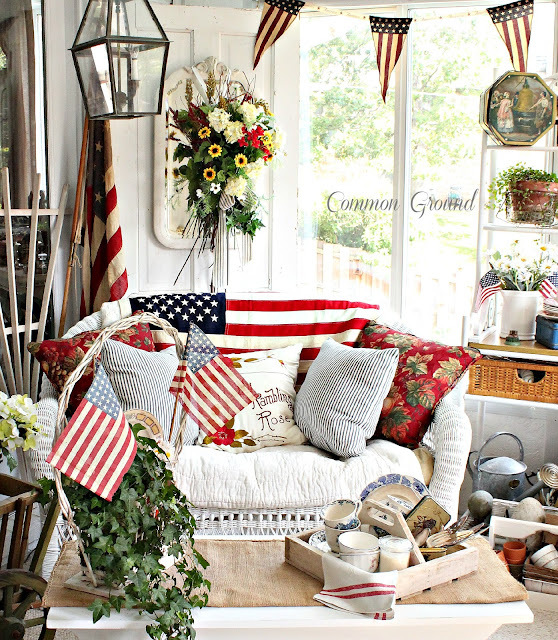 I love this beautiful porch. Thanks for sharing, Kim. THIS is what should've been on the cover of Country Living for July! 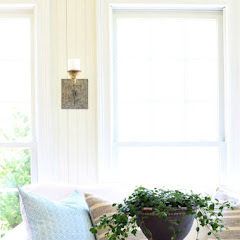 Most gorgeous summer room ever! SO patriotic, vintage, compositionally dynamic, grab a cup of joe and sit with me awhile porch ever! Your displays are exquisite! Such a darling room. So cute and festive. I need to study all the wonderful vignettes. Great feature, Kim. Hope you had a wonderful 4th. This is my favorite room in Debra's home too. I just love everything about it. So cozy! I am so happy to see Debra's porch today...I always marvel at the way she always decorates it so beautifully for the seasons and holidays...Debra, you have so many amazing vintage and antique items..and so love how you display them!...Thanks Kim for presenting Debra's porch today...the perfect favorite room for this week!!! I love Debra's sun porch and I'm so glad she chose this room to share! I love seeing the different ways she's decorated throughout the year. I agree with Andrea that this should definitely be a Country Living cover. Thanks for sharing Debra's favorite room, Kim! I have always just adored Debra's porch! Her cozy styling makes this such a happy place. Great feature! It looks like something out of Country Living magazine. What a wonderful place to play and dream. Thanks for sharing this fabulous room! So great and creative! Love it. What amazing accessories! 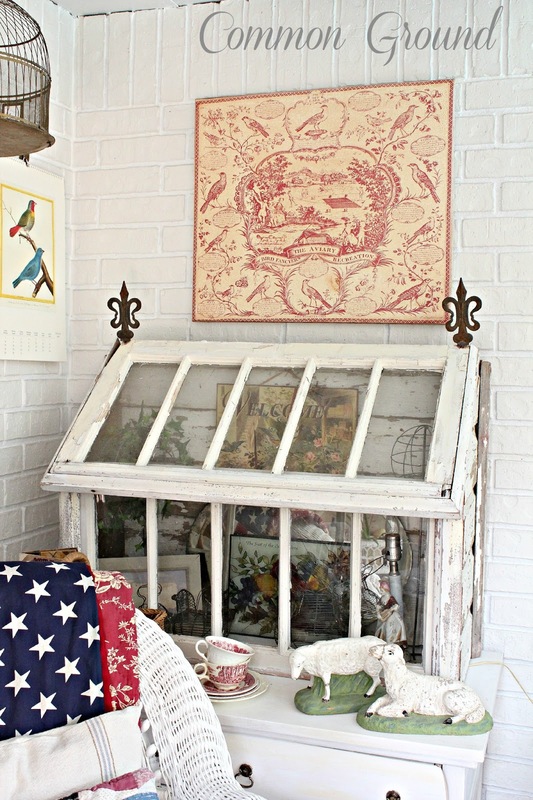 Love that vintage conservatory. How wonderful! And all the patriotic touches are perfect, too. Thanks for taking us on a visit through this super cute room! I LOVE your attention to detail and your porch. Hubby and I are going to be DIYing our porch this year and your porch is such an inspiration! Thanks so much for sharing! Debra, I'm so glad you shared your sunroom. It's my favorite too! You have a wonderful way of putting things together, layering and fluffing! You really have an eye for detail and whimsy!!! 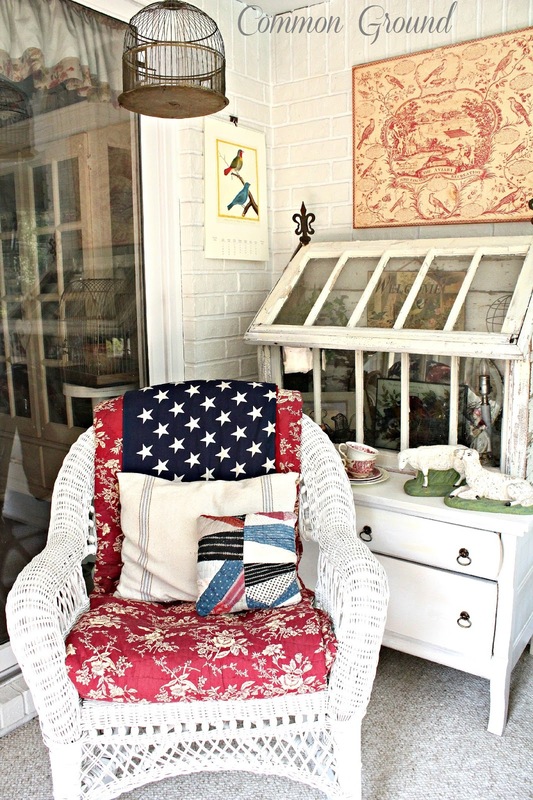 The red,white and blue theme works perfectly with your beautiful sunroom. Looks like a page from a magazine!!!! Your fav room is my fav room of yours. 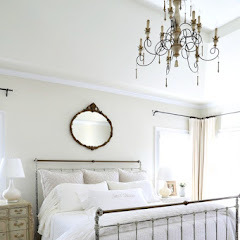 I always love when you style this room and share it with all of us. It is so bright and welcoming. I would be out there with the furry girls napping every afternoon!!!!!! So sweet Debra like you. Thanks Kim for sharing Debra's favorite room with us. THANKYOU, Kim, and all you ladies for the sweet comments. They've made my week!! I so appreciate you inviting me over, Kim! Have a great weekend, everyone! 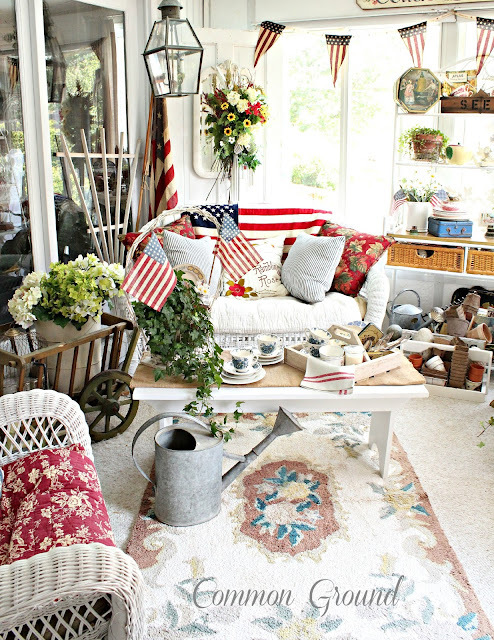 Debra's porch is a favorite blog hangout of mine. She may not always know when I visit it, but I'm often there enjoying all her fun collections. Today, I'm especially enjoying her chippy blue lock box on the baker's rack. 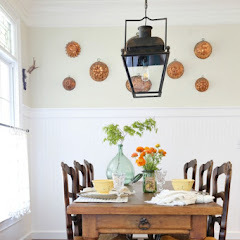 Thanks for hosting favorite rooms from bloggers. As always, I thoroughly enjoy seeing their spaces and decor. 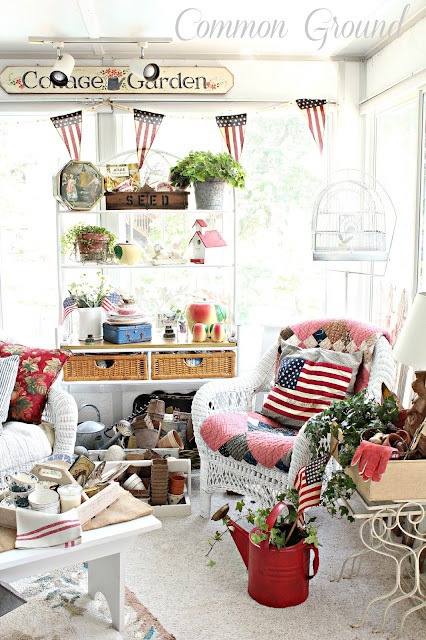 Luv, luv, Debra's cute sun porch. It's so special with all of her treasured touches. 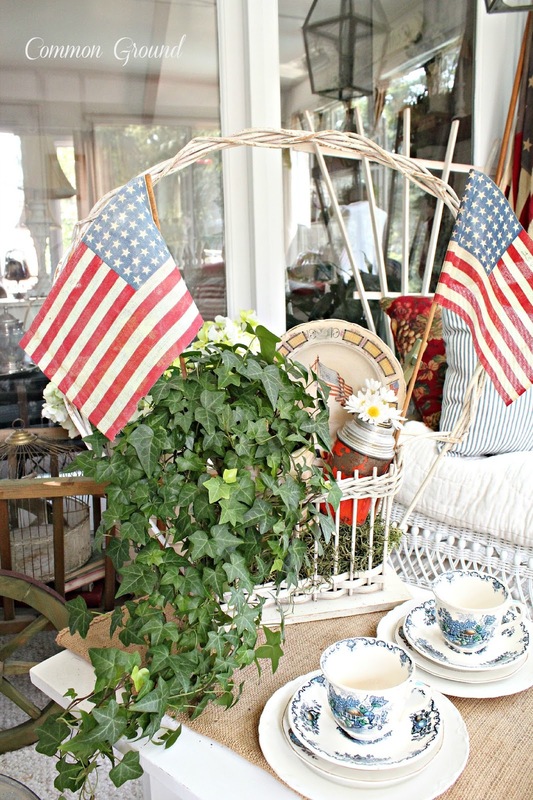 I have always loved Debra's porch and use it for inspiration when I am decorating. thanks for featuring it in such detail. 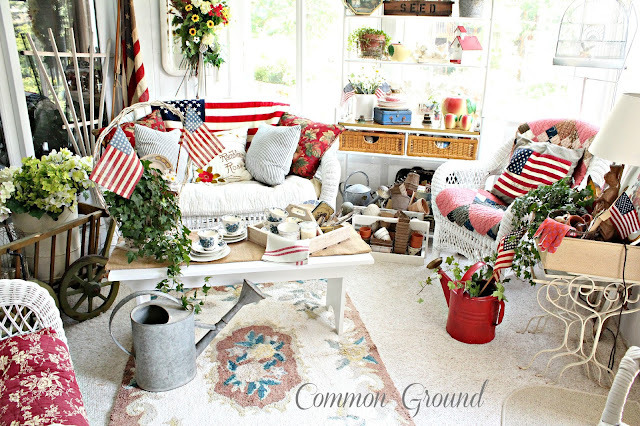 I love Debra's blog Common Ground and this little sun porch! She always has such festive and fun decorations! Thank you for sharing! This is one of my favorite rooms too. I love the red accents, the "clutter", and Debra's knack for organizing her fabulous clutter into pleasing vignettes. 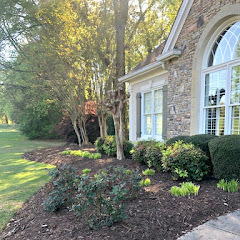 Love seeing Deb's porch, it always look beautiful and ready for a magazine cover. Debra's sun porch has always been a fun room to see on her blog. She's always changing it up and adding vintage garden items and holiday decorations in unique ways. I like the summery feel of her room and all the personality she brings to the room. This is such a happy, festive space! I follow Debra's blog, but it's always fun to see the whole room at one time. 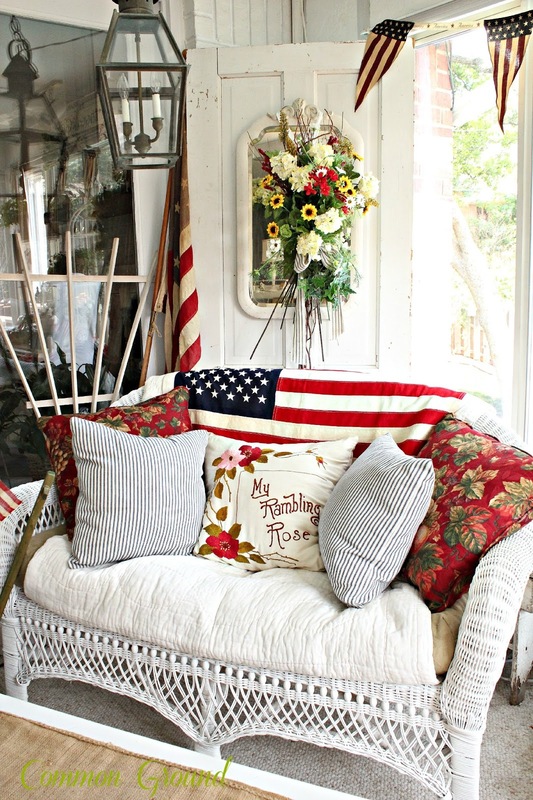 Thanks for sharing Debra's festive porch today, Kim! I think it would be my favorite place to hang out, too. Such a fun feature, Kim! 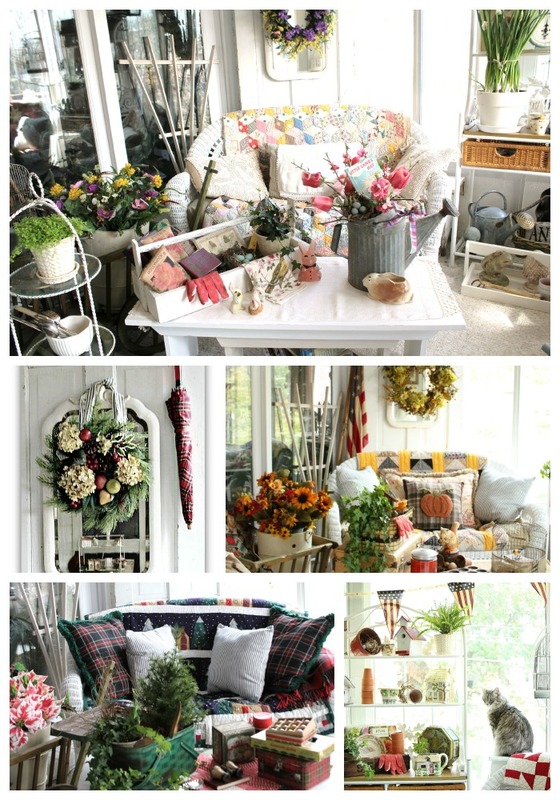 I would love to have a cheery space like this. I especially love that there is so much vintage and garden stuff. Weird long weekend! Hope you have some fun planned! I love Debra's sunroom. It's always fun to see how she decorates it for each season! Hi Kim, I adore Debra's sun room! It's as sweet as she is. Loving it all decked out Americana style. Thanks for sharing! I would spend every possible minute on this porch. It is a wonderful space! Hi Kimmie! Oh, I just adore Debra's sunporch! Such pretty things and she certainly knows how to display them! I've missed visiting you and am trying to catch up! Hope you're oding well. What a comfy spot to look out to! Lucky "fur girls"! Perfect place to spend a cool morning! Perfectly imperfect! I love this room! So fun! 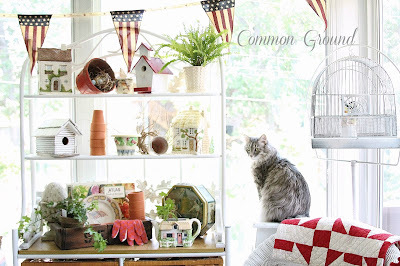 I never get tired of seeing all the fun things on Debra's sun porch! 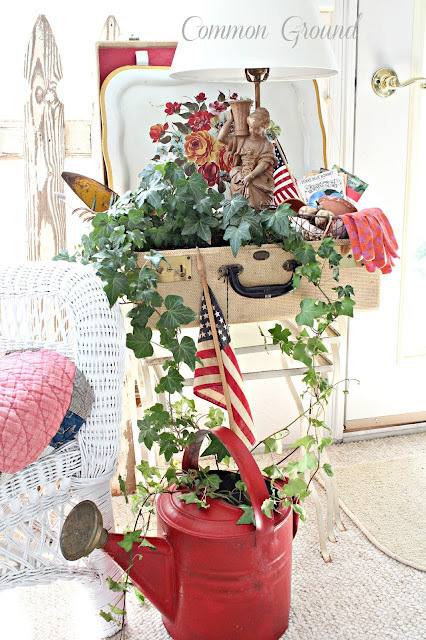 Kim, I ADORE Debra's porch and her vignettes! 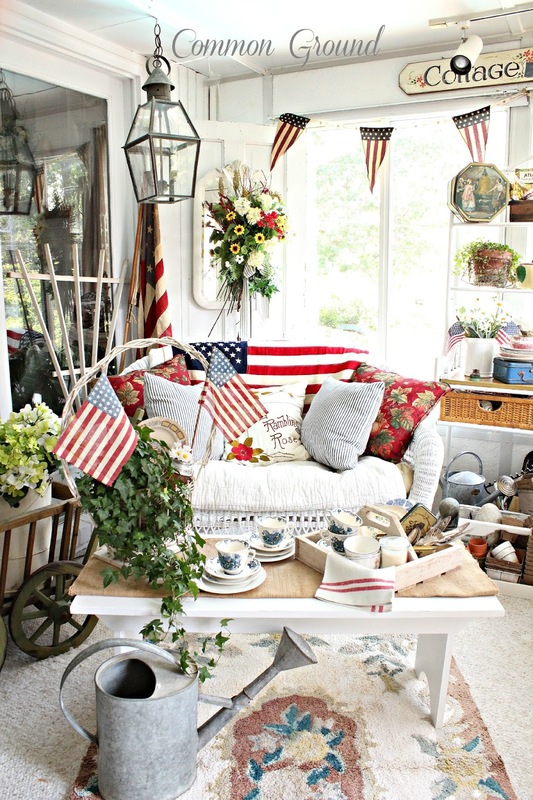 The perfect spot to showcase her Americana!